Antisemitism is enjoying a renaissance. In Britain, attacks on Jewish people or property have increased by 260% over a two-year period; in France, synagogues have been firebombed. The antisemitic upsurge is closely linked to events in the Middle East and opposition to the policies of Israel and the USA and in the main does not come from the traditional right. It has nothing to do with legitimate criticism of Israel’s policies and must be distinguished from this. Sometimes the antisemitism masquerades as “anti-Zionism” and other times it is naked Jew-baiting. Anti-racists and anti-imperialists have to root it out argues Steve Silver. Shortly after the murderous terrorist attacks of 11 September 2001 in the USA leaflets circulated outside some London mosques purporting to identify who was behind the attacks. According to the British-based Islamic fundamentalist leafleters, the attacks were carried out by the Israeli intelligence service Mossad. The proof of this was in the supposed fact that hundreds of Jews stayed away from work that day, after they had been tipped off that something untoward was going to happen. The claim is so absurd that it doesn’t warrant a response. It is mentioned here because it is part of a barrage of antisemitic conspiracy theory literature that has been circulating in Britain via Islamic fundamentalist and other sources. In some ways this is unsurprising: after all the Middle East is the main source for the printing of “classic” antisemitic conspiracy works such as The Protocols of the Elders of Zion and Henry Ford’s The International Jew. In Britain some of these staple fascist texts find their way into Islamic bookshops, where they are often openly displayed and sold. With old antisemitic conspiracy theory material so widely available, it is no wonder that there are those who have absorbed this world view and apply it to modern-day events. If the quotation had been genuine, it would be bad enough to see it reprinted. In fact it is a hoary antisemitic forgery written by the US Nazi sympathiser William Dudley Pelley in Liberation in 1934. In 1942 Pelley was sentenced to 15 years’ imprisonment for sedition for his pro-Nazi activities. One of the most active of the Islamic fundamentalist groups distributing antisemitic literature is al-Muhajiroun, which claims it is “The Voice, The Eyes, and the Ears of the Muslims”. 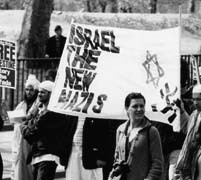 Its leaflet advertising an anti-Israel demonstration organised by the Palestine Solidarity Campaign in May 2002 was headed, “Israel the cancer that must be removed”. Among several bullet points it stated, “The Defence of the cancer is the lie of the Holocaust”. The real measure of al-Muhajiroun’s support, or rather lack of it, for the Palestinian cause is that in the same leaflet it described the PLO and Yasser Arafat as “the agent of the cancer”. While Holocaust denial material is commonplace in the Muslim world, it is something that is rare on the left, though not unheard of. A leaflet issued by the Trotskyite Socialist Voice in the northwest of England (Salford) in 2002, for example, advertised an internet link for information “on the history of Zionism”. The link is to a Holocaust denial site run by Bradley Smith of the US based Institute for Historical Review (IHR), an organisation which has been exposed many times in Searchlight and which has links to nazi groups across the world. It would be charitable in the extreme to say that there may be an innocent explanation for this amazing fact, for the top of the page of the advertised link even states that it is a Holocaust denial site! Much more commonplace on the left than Holocaust denial is the comparison of Israel with Nazi Germany. Quite how offensive this is to most Jewish people seems lost on those who do it. Even if we were to put aside the offensive nature of the comparison, it has to be said that such a comparison is rarely used to describe other regimes, even those that have actually committed genocide. This version of “anti-Zionism” tends to portray Zionism as a Jewish version of Nazism. In this almost surreal scenario, the victims of Nazism have become the new “nazis”. It shouldn’t really need pointing out that whatever one thinks of Israel’s policies and actions, and the human cost of the conflict, there is still massive legal opposition to those policies from Arab and Jew alike inside Israel – hardly something that was allowed in Nazi Germany. All manner of progressive forces are represented in the Knesset (parliament) from socialist-Zionist to communist and Muslim parties. Of course at the moment Israel is in the hands of the right wing and consequently is pursuing right-wing policies. This does not make it Nazi, or even fascist, though. Crucially, however appalled one might be by Israel’s treatment of the Palestinians, it is not systematically exterminating them. If it isn’t bad enough to find organisations and individuals that compare Israel to Nazi Germany, it is not uncommon to find those that go further and argue that Israel is actually worse than Nazi Germany. For example, at the Palestine solidarity demonstration in London on 18 May 2002, Leila Khaled, a leading figure in the Popular Front for the Liberation of Palestine (PFLP), claimed that Zionism had “exceeded Nazism”. Another “Nazi-Zionist” theme is the claim that some Zionists collaborated with the Nazis. However, many were brave resisters and fighters against fascism who were martyred in that struggle. Among their number is the leader of the Warsaw Ghetto Uprising, the socialist-Zionist Mordechai Anielewicz. Also there is the Hungarian born Hannah Senesh who moved to Palestine just before the Second World War and fought in an elite British parachute corps against the Nazis. Captured by fascists behind enemy lines in her native Hungary, she was brutally tortured and executed. Zionism is neither a conspiracy nor the invention of imperialism, nor inherently racist. It came into existence as a response to antisemitism and such things as the pogroms, persecutions and ritual murder libels in Europe. Dr Theodor Herzl, the best known of the early Zionists, became a political Zionist as a result of the infamous antisemitic frame-up of Captain Alfred Dreyfus in France in 1894. However, the single most important factor that made Zionism popular among Jewish people was the Holocaust. Even those who did not see their own future, or even the future of the Jewish people, bound up in Palestine recognised that there must be a solution to the Jewish refugee problem created by the destruction of Europe’s Jews. It was clear that the solution was not going to be found in Europe or the countries that closed their borders to large-scale Jewish immigration. The Zionist movement is a nationalist movement, and carries with that all that other nationalist movements do. It harbours in its ranks reactionaries who would do all in their power to prevent the creation of a Palestinian state. Yet it also harbours a progressive left wing which wants nothing but peace in the Middle East. In Israel itself there exists a massive peace movement, opposed to the actions of the government and military, and which supports the creation of a Palestinian state alongside Israel. It is commonplace on the left to read that Israel was an imperialist creation, promised by Lord Balfour to the Zionists in the Balfour Declaration of 1917. In fact it would take another 31 years before Israel was created. And that came about not from some British declaration but after six million Jews perished in the Holocaust and tens of thousands became stateless refugees, often living in displaced persons’ camps in what was formerly Nazi-occupied Europe. Britain’s true attitude to Jewish settlement in Palestine could be seen in the fact that it did its utmost to prevent Jews arriving in the country, even sending ships full of Holocaust survivors back to Germany, the source of their torment. It seems that today’s anti-imperialists have either forgotten or don’t realise that the vast majority of them would have supported the creation of the State of Israel in 1948 as a blow against imperialism. In the immediate aftermath of the Second World War the Jewish national movement in Palestine was engaged in an underground war against the British Army, which occupied Mandate Palestine at the time. Pressure from within Palestine and outside forced the British out of the region. Gromyko went on to argue that there was a legitimate Jewish claim in the region: “if only because, after all, the Jewish people has been closely linked with Palestine for a considerable period of history”. Echoing Lenin’s description of how the Jews fared under Tsarism, Gromyko added, “that as a result of the war which was unleashed by Hitlerite Germany, the Jews, as a people, have suffered more than any other people”. The State of Israel was formed as a result of a 1947 United Nations partition plan which was intended to create an Israeli state alongside a newly independent Palestinian state. Around the world the left celebrated Israel’s birth. The invasion of Arab armies who believed that they could strangle the fledgling Jewish state, and the subsequent war, put paid to the creation of a Palestinian state at that time. Regardless of what has happened since then, it remains a fact that Israel was born in this way. It would be absurd to argue that all opponents of Zionism, all anti-Zionists, are antisemitic. It would be equally absurd to tar all opponents of Israel’s policies and actions as antisemitic. However, much of what passes as anti-Zionism and anti-Israel sentiment has nothing to do with legitimate debate with a nationalist ideology, or opposition to the actions of the Israeli government or military, but more to do with traditional antisemitic conspiracy theory. The idea that a cabal of Jewish people controls the world through political skulduggery has been a staple of antisemites since they propagandised against the French Revolution after 1789. However, it was in pre-revolutionary Russia at the turn of the twentieth century that the most infamous antisemitic Tsarist forgery, The Protocols of The Elders of Zion, was produced. It was used by counter-revolutionaries as a propaganda weapon against the Bolsheviks. The Protocols still circulates today and many other antisemitic tracts are based upon it. The Protocols was a standard German Nazi text. One might have thought that with the defeat of Nazi Germany, the idea of Jewish world conspiracy would be buried, especially in a country that itself suffered so much under fascism and helped give birth to the Jewish state. However, the Soviet honeymoon with Israel was a short-lived affair. In the Soviet Union and among reactionary Arab nationalists hostility towards Jews evolved into “anti-Zionism” as the main vehicle for the “Jewish conspiracy”. In spite of the fact that under Lenin’s leadership antisemitism was made a criminal offence, it was perpetuated in the Soviet Union in the Stalin era. At the Twentieth Congress of the Communist Party of the Soviet Union (CPSU) in 1956, Nikita Krushchev, the Soviet leader, revealed a long list of antisemitic crimes committed during the period of Stalin’s rule, including: the purging of Jewish party leaders in other socialist countries; the general shutdown of Jewish cultural institutions in the Soviet Union after 1948; the murder in August 1952 of leading Soviet Jewish writers and intellectuals; and most infamously the so-called “Doctors’ Plot” of 1953, in which Stalin accused a group of mainly Jewish physicians of plotting to murder him on behalf of “Zionism” and “western imperialism”. The antisemitism of the Stalin era was subsequently recognised as such, and condemned in the Soviet Union. Unfortunately, its legacy endured, though not on a systematic basis, until 1967. One well publicised aberration occurred in 1963 when the Soviet academic Trofim Kichko published a work that was crudely antisemitic, entitledJudaism without Embellishment. It contained antisemitic illustrations and the text claimed that Judaism, Jewish bankers, Zionism, Israel and Western imperialism were engaged in an international conspiracy. Amid worldwide protest the publication was withdrawn. What changed the publication of antisemitic propaganda post-Stalin in the Soviet Union from an aberration to a larger-scale phenomenon was the Six Day War of June 1967, when Israel defeated Egypt. Within days of the Israeli victory the Soviet media branded Israel’s Moshe Dayan a “pupil of Hitler” and Zionism as racism. Along with the most reactionary of Arab nationalists, they pushed this position on the international stage at the United Nations and elsewhere. In this new climate Kichko was rehabilitated and published further works such as Judaism and Zionism (Kiev 1968). As the Soviet Union departed from anything that could be remotely described as a Leninist analysis of the situation in the Middle East, many other Soviet writers who churned out material of a similar nature joined Kichko. It is echoes of these ideas that are current among some on the British left, even among those who would be horrified to be remotely associated with anything to do with “Stalinist” or nationalist antisemitism. It can only be assumed that those who claim that Israel is Nazi and that Zionism is racism have no knowledge of the ideas’ antecedents. However, there are some on the left today who would call themselves revolutionaries who believe that Israel should be destroyed. Hardly surprising, when they think that Israel is no different from Nazi Germany. Those who put forward this position should ask themselves what should happen to the Jewish people who live in Israel today if the country ceased to exist. And anti-racists should ask them to which other people, apart from the Jewish people, would they deny the right of nationhood? The penchant for US (and British) intervention in the affairs of sovereign states abroad is something that should be condemned and opposed. Those countries that do their utmost to defend their independence are fighting against imperialism. However, merely raising anti-imperialist slogans does not make the nationalist movements of those countries, or their leaders, necessarily progressive. As with Zionism, these nationalist movements – the Palestinians included – contain both progressive and reactionary camps. Just as it is necessary for the Israeli people to combat their own national chauvinists, annexationists and would-be colonialists, so it is important for others in the Middle East to combat their reactionaries. To say and do nothing against reactionaries in the anti-imperialist camp, because this could be seen to damage the fight against imperialism, is a serious error. History has taught us where that kind of politics leads. In Indonesia, hundreds of thousands of communists and others on the left were massacred while “anti-imperialist” slogans were raised. In Iraq, communists and other progressives were tortured while genocide was committed against the Kurds. In Iran the “anti-imperialist” Islamic fundamentalists butchered communists who had supported the national revolution. The idea of a world Jewish conspiracy, so popular with the Tsarist propagandists in their anti-Bolshevik propaganda at the turn of the last century, and which formed a central part of Nazi ideology during the 1930s and 1940s, is unfortunately alive and well in Britain today. It is primarily the preserve of Islamic fundamentalists, but to their shame virtually the entire left has remained silent on the issue, and some have actually recycled this nonsense. It seems that people’s outrage at such things as Israel’s actions in Jenin in April 2002 triggers an emotive response bordering on hysteria. The reflex action is often antisemitic and has nothing to do with socialism. It is as if some believe that a little antisemitism is justifiable when confronted with Israel’s policies. The German Social Democrat August Bebel once described populist antisemitism as the “socialism of fools”. Antisemitism, like other forms of racial hatred, does not always come from the fascist right. Just as the left and labour movement accepts that it is perfectly capable of harbouring racist practices against black people, so it should recognise this is the case with antisemitism too. Those who should know better often cross the line between legitimate anti-Zionism and antisemitism. Because imperialism is based, among other things, on racism, genuine anti-imperialism has to be anti-racist to its marrow. An anti-imperialism that is soft on antisemitism is not an anti-imperialism at all, but merely a prop for national chauvinism and racial hatred.